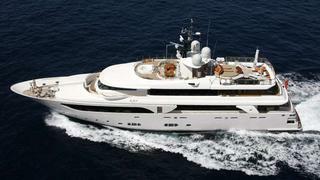 News just in from Burgess that they've listed for sale the 42.6m motor yacht Kate. Built by Italian superyacht yard CRN Ancona to RINA class,* Kate* was delivered in 2010 as one of the popular CRN 43m series. She has unrivalled volume for a yacht of her length and offers versatile living and entertaining areas both inside and on deck, all with tasteful contemporary styling. Accommodation is for up to 11 guests in a five stateroom layout configured as a master suite, three double staterooms and a twin cabin with a Pullman berth.All staterooms have en suite facilities. Special features include a spacious side-loading garage with a 21' Castoldi tender, and a well equipped gym in the open transom with direct access to the sea. Twin 1,400hp Caterpillar engines give her a range of 4,000 nautical miles at her cruising speed of 13 knots. Lying in San Remo, Italy, Kate is asking €14,950,000.